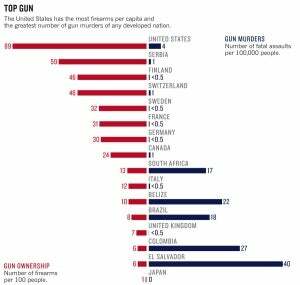 There are almost as many firearms in the United States as there are citizens. Garen Wintemute is one of few people studying the consequences. NRA leaders were upset with the CDC for funding work by another researcher who had found that people with a gun in their home were 2.7 times more likely than those without to be murdered3, and 4.8 times more likely to commit suicide4. In 1996, the NRA persuaded congressman Jay Dickey (Republican, Arkansas) to insert language into a budget bill to prohibit the CDC from advocating or promoting gun control. (That ban has been renewed every year since then.) Dickey's amendment also stripped $2.6 million from the agency's 1997 funding — the exact amount that the CDC had spent on firearm research the previous year.